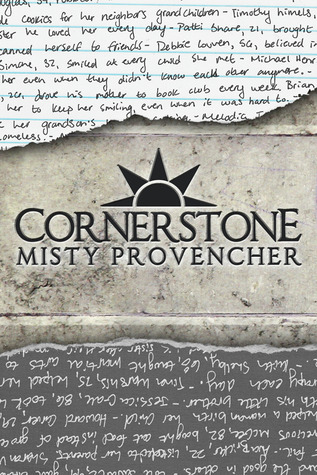 I feel so honored that Misty Provencher asked Book Nerds to be part of the Cornestone Book Tour. Along with that, there is an amazing interview and a GIVEAWAY. It was not too long ago that I read this book. It was much different than most books that I have read. You can read my review here. The book has a very unique story line and you will fall in love with the characters. You can check out the reviews on Good Reads and Amazon. Misty is so kind to be helping out with this giveaway. 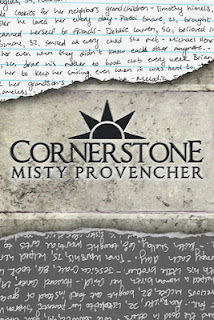 For our international fans Misty will be giving a eBook of Cornerstone. If you are US fan that you can receive a paper copy. All you have to do is leave a comment along with your email. I will pick a winner on May 27th, 2012. When did you realize that you wanted to be an author? Always. In grade school we had to write a little story and the teacher turned it into a book. I loved it so much, I turned in five of them before she told me to knock it off. In high school, I had to do a paper that would map a geographical route across the U.S. and there had to be expenditures for gas and food along the way. I turned what had to be a three page paper into a 40 page adventure. It’s what I do. Where your characters, Nalena and Garrett, based off of someone?? Not exactly. The feelings Nalena has for Garrett, however, are loosely based on this mad crush I had when I was in 7th grade. The guy was named Ted and his family would visit his grandparent’s cottage in the summer, just down the street from my house. He was a little older than me and I hardly knew him, but he was a total hottie and I went to complete idiot bubbles whenever he was around. So, Nalena and I have that in common. How did you come up with the storyline of Cornerstone? It was the process of dreaming backward. I had a dream eons ago and it was one of those dreams that just sticks with you. I can still remember a lot of the details from it. It took several years of floating around in the metal computer before I realized it was a book, waiting to be written. But the dream was the ending of the story, so I had to trace it back to figure out how the dream would’ve come about. So, that’s where Cornerstone came from. Can you give us any insight into Keystone? Do you know when it will come out? My cover artist is currently working on the Keystone cover, but I keep pushing back the release date because I’ve got a lot of revisions to do before it’s ready to Sorry for the delays, but things have to be right, you know? I’m hoping to get it out by the fall, if not earlier>We’re going on a quest in Keystone, so fasten your seatbelts. You’ll see more of Garrett and Nalena, more of the Reese family and the Addo and there will be lots of new characters that I can’t wait for you to meet. Cornerstone introduced you to the Ianua community, but Keystone is going to show you how the whole shebang works. What other projects are you working on, or would like to work on in the future? I’ve got one story that’s half finished (a dark YA fantasy) one that is laid out and ready to be written (it’s like The Breakfast Club meets A Midsummer Night’s Dream), and about five more beating on the door. I’ve learned from Keystone that you really want to push through and get the draft down as quick as you can. That’s the challenge now- get them down and get them out into the reader’s hands. I just love you, Mary. There, I said it. Love Misty Provencher's style of writing and her personality jumps off the page. She is a friend to all writers encouraging and sharing. She is a gem and I would love to have a copy of her book. Cornerstone sounds different from any of the other books I've been reading and it's absolutely adorable that Nalena's feelings for Garrett is loosely based on the author's 7th grade crush. I cannot wait to read Cornerstone! <33 Fab interview!